Saturday January 11th 1902 I was very busy all forenoon with baking and sweeping and went down home in the afternoon while Will went on to town. weather colder. Sunday January 12th 1902 It was a cold day but I went down home alone to dinner. It was jist family company and they had turkey for dinner. Mollie came back tonight. I read all the evening in a book that I am going to try a new departure in the way of [dirt?] to see if I cant feel well once more. Monday January 13th 1902 weather some warmer. I was busy with the kitchen work all morning and sewed some in the afternoon. Will down town. 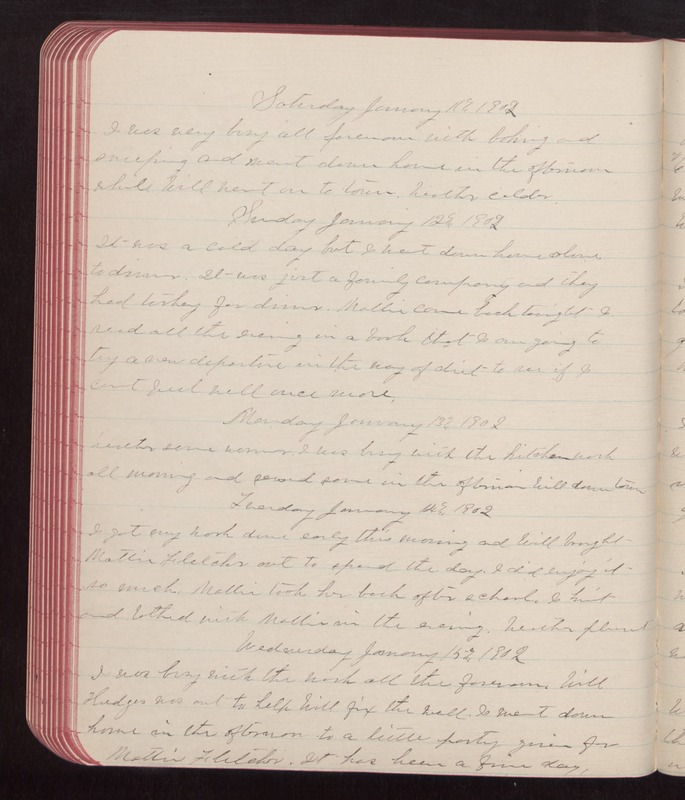 Tuesday January 14th 1902 I got my work done early this morning and Will brought Mattie Fletcher out to spend the day. I did enjoy it so much. Mollie took her back after school. I knit and talked with Mollie in the evening. weather pleasant. Wednesday January 15th 1902 I was busy with the work all the forenoon. Will Hedges was out to help Will fix the well. I went down home in the afternoon to a little party given for Mattie Fletcher. It has been a fine day.